If you encounter a program with an extremely random name, it is likely that you are dealing with adware created by SuperWeb LLC. Useful Program is one more ad-supported program created by this company, and we can assure you that it is the opposite of being useful. The interface of usefulprogram.com is identical to the ones we have encountered when analyzing other SuperWeb applications (e.g., Mountain Bike, Steel Cut, and Key Shift), which is why it did not take us long to realize that it requires removal. 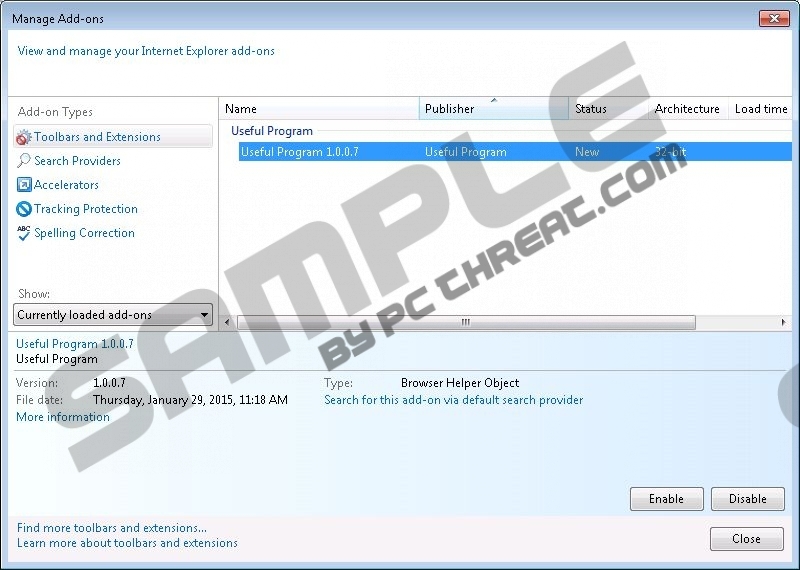 Read this report to learn how to remove Useful Program from your Windows operating system. Useful Program might display advertisements that are easily identified due to the tags "Ads by Useful Program" or "Provided by Useful Program." These tags are the best indication that you need to delete Useful Program from your operating system. Of course, since the suspicious application does not travel using illegal means, most computer users will expect the ads to show up. Unfortunately, this means that they might interact with the Useful Program ads without thinking that anything bad will happen because of it. The truth is that you could be exposed to malware installers, phishing scams, and bogus offers, which is the reason we are talking about Useful Program and its removal. Sooner or later all computer users realize that Useful Program is not useful at all, and the removal of this ad-supported program should follow from this realization. Luckily, the new version of the Google Chrome browser automatically blocks Useful Program, which means that you will not face suspicious ads if you use that browser. Of course, this does not mean that the operating systems of Chrome users are not infected with Useful Program and its secretly running tracking cookies. Our malware researchers warn that you need to delete Useful Program from your PC regardless of which browsers are infected. Our malware experts have tested Useful Program to prepare the most helpful removal guide. If you follow our guide, we are sure that you will find Useful Program deleted from your operating system in no time. Of course, adware can be upgraded by its developers, which is why you should also install a malware scanner to find if the removal operation was successful. An automatic malware remover is the best instrument when it comes to the removal of Useful Program and other suspicious programs. We recommend installing it not only to delete malware, but also to protect your Windows system. Locate the program you wish to delete, right-click it, and select Uninstall. Launch RUN (tap Win+R), type Control Panel, and click OK.
Move to Uninstall a program and locate Useful Program adware. Quick & tested solution for Useful Program removal.